The grass is always greener on the other side, or so it would seem. In fact, when the author crossed the equator he found a magical world of exciting plants with exotic shapes and striking colors. Accompany the author as he travels to Australia, Chile, New Zealand, and South Africa so you can see what your garden has been missing. He takes readers on a practical tour to inspire and show them how these unfamiliar plants can be used to create great gardens. In the book he features almost 1500 plants and emphasizes their garden uses. Though some may think these exotic species are difficult to grow, Thompson shows that to be untrue. He provides case studies and extensive information on their hardiness in cool areas where frost occurs. The book is so well organized you can find the plants you want in a hurry. There are chapters on seaside plants, shady areas, trees for cool areas, sunny gardens, tropicals, containers, greenhouse plants, perennials, and others. One section deals with case studies of Northern hemisphere gardens using exotic, tropical-style plants. For these, he uses examples from California, the Mediterranean, the Pacific Northwest, and Britain. 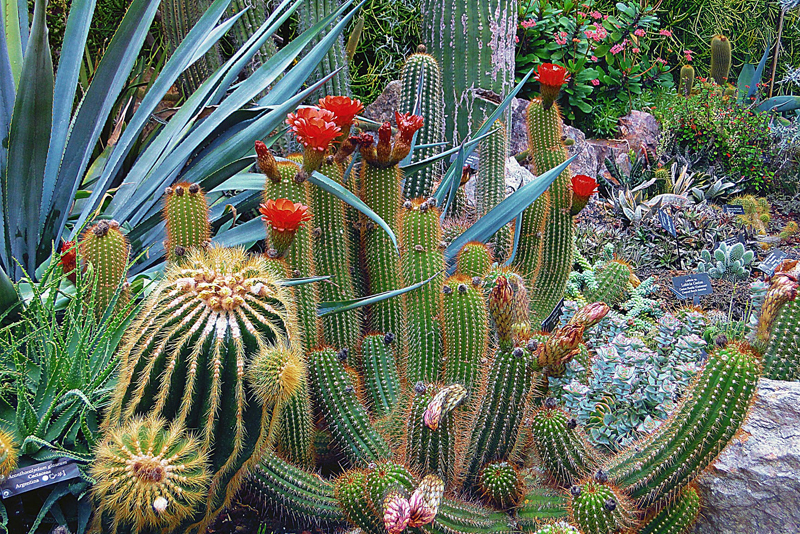 Though the book isn’t devoted exclusively to cacti and succulents, many different kinds of these plants are profiled by the author, including Pachypodium, ice plant, and others. At the end of the book there is a very handy table giving the hardiness zones for the plants. In this table, the plants are listed alphabetically by Latin name, so you can find what you want very easily. The hardiness is given in zones 1 to 11 with the temperatures given in both Fahrenheit and Centigrade. There are also color maps of the different areas of the Southern hemisphere. In addition there is an extensive bibliography that readers will find helpful. Besides general references, there are ones for various geographic regions, such as Australia, etc. The book is illustrated with lovely color photos of plants and gardens. Readers are sure to be inspired by this book with its descriptions of gorgeous gardens and exotic plants. In addition to being a vital source of inspiration, it contains so much practical information on how to use these plants to create exotic, one-of-a-kind gardens.